ANAHEIM, Calif. (AP) Shohei Ohtani’s pinch-hit home run in the seventh inning sent Andrew Heaney and the Los Angeles Angels to a 4-3 victory over the Los Angeles Dodgers on Sunday. Albert Pujols also went deep for the Angels, tying the score at 3 in the sixth. Justin Upton had a two-run single. Heaney (5-6) allowed only three hits and equaled a career high with 10 strikeouts in seven innings to help the Angels take two of three at home in the Freeway Series. He gave up an early three-run homer to Yasiel Puig, who later left with an oblique injury. Ohtani drove his first career pinch-hit homer a projected 443 feet to center field off reliever JT Chargois (2-2). It also was the Angels’ first pinch-hit home run of the season and Ohtani’s seventh in the majors. The two-way rookie star from Japan, unavailable to pitch lately because of an elbow injury, fouled a ball off his knee one day earlier and experienced soreness. Before the game, it was unclear if he would be able to come off the bench. Justin Anderson got Cody Bellinger to ground into a game-ending double play for his fourth save. CLEVELAND (AP) – Brett Anderson came off the disabled list and pitched effectively into the sixth inning before turning things over to Oakland’s outstanding bullpen as the Athletics blanked Cleveland. Anderson (1-2) had been sidelined with a shoulder strain, one of several injuries to the A’s starting staff. But the left-hander looked sharp in his first start since May 18, limiting the Indians to three hits and leaving with a 4-0 lead. Stephen Piscotty hit a two-run homer off rookie Shane Bieber (4-1), and Jed Lowrie had a solo shot as Oakland won for the 10th time in 12 games to take two of three from the Indians. The A’s are 18-6 against AL Central teams. Yusmeiro Petit, Ryan Buchter and Emilio Pagan finished the combined five-hitter as the A’s moved 10 games over .500. HOUSTON (AP) – Dallas Keuchel pitched seven strong innings, Jose Altuve homered and Houston manufactured the go-ahead run in the seventh to complete a four-game sweep of Chicago. Altuve’s solo shot put the Astros up 1-0 in the fourth. Chicago starter Lucas Giolito (5-8) had retired nine straight after Altuve’s home run when Yuli Gurriel got Houston’s second hit of the game, a double with no outs in the seventh. He went to third on a flyout and the Astros went up 2-1 on a sacrifice bunt by Marwin Gonzalez. Keuchel (6-8) yielded six hits and a run to win his third straight decision. Hector Rondon struck out two in a perfect ninth for his seventh save. TORONTO (AP) – Brett Gardner hit a tiebreaking single in the 10th inning and New York beat Toronto for its fourth win in five games. Former Yankees reliever Tyler Clippard (4-3) hit New York’s Greg Bird with a pitch to begin the 10th, and Tyler Wade came on to pinch run. Austin Romine sacrificed Wade to second, and Gardner followed with a single. Chad Green (5-1) pitched one inning for the win and David Robertson finished for his second save. Regular closer Aroldis Chapman, who left Saturday’s game because of a sore left knee, was available but did not pitch. PHOENIX (AP) – Wil Myers homered for San Diego for the fourth time in two days, connecting in the 16th inning off Arizona catcher Jeff Mathis. Myers, who hit three home runs Saturday, clubbed a 3-2 pitch from Mathis (0-1) over the right-field fence with two outs. The Diamondbacks used two starting pitchers out of necessity. Zack Greinke began the game and Zack Godley entered in extra innings. Manuel Margot had a career-high five hits for the Padres. All-Star closer Brad Hand (2-4) worked two innings for the win in a game that lasted 5 hours, 31 minutes. DETROIT (AP) – Austin Bibens-Dirkx pitched Texas past Detroit. Jurickson Profar homered in the first inning and the Rangers split the four-game series. Bibens-Dirkx (2-2) allowed three hits and a walk in 5 1/3 innings. He struck out five. All-Star Shin-Soo Choo of the Rangers hit an infield single with two outs in the ninth, extending his on-base streak to 47 games. He surpassed the team record of 46, set by Julio Franco in 1993. Jose Leclerc struck out five in 1 2/3 hitless innings of relief for Texas. Jake Diekman pitched the eighth, and Keone Kela finished for his 22nd save in 22 chances. Michael Fulmer (3-8) allowed two earned runs and five hits in seven innings. NEW YORK (AP) – Nathan Eovaldi took a perfect game into the seventh inning, C.J. 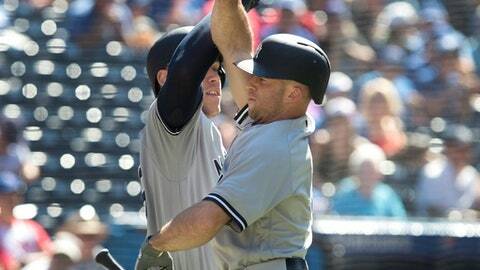 Cron hit an early three-run homer and Tampa Bay routed New York. Eovaldi retired his first 18 batters before Brandon Nimmo lined a clean single to right field leading off the seventh. Nimmo was quickly erased on a double play, and Eovaldi faced the minimum through seven innings. The right-hander, who returned this season from his second Tommy John surgery, struck out nine. Andrew Kittredge pitched the final two innings for the Rays, giving up a single in the ninth before finishing the two-hitter. Cron’s home run gave the Rays a 3-0 lead in the first. He connected off Chris Flexen (0-2) for his 17th of the season, setting a career high. PITTSBURGH (AP) – Nick Kingham pitched six solid innings and had two RBIs, helping Pittsburgh avoid a three-game sweep against Philadelphia. In his eighth major league start, Kingham (3-4) allowed one run and four hits with five strikeouts and one walk for his first win since May 4. The right-hander retired the first 20 batters of his MLB debut against St. Louis on April 29 before giving up four runs in a 6-4 win in his second start. Felipe Vazquez struck out the side in the ninth for his 18th save. Drew Anderson (0-1) allowed four runs and eight hits in his season debut for the Phillies. WASHINGTON (AP) – J.T. Realmuto had a career-high five hits and drove in three runs, Martin Prado got four hits and Miami snapped a 14-game losing streak to Washington. The Marlins piled up a season-high 22 hits, the first 19 of which were singles, and salvaged the finale of a four-game series. Adam Conley (3-1) pitched two scoreless innings of relief for the win. Mark Reynolds, given a start at third base by the Nationals after his 10-RBI game Saturday night, went 2 for 4 with a walk. He also pitched one-third of an inning, retiring the only batter he faced in the ninth. Tanner Roark (3-11) hasn’t won since June 6. He allowed four runs, 10 hits, three walks and hit two batters over four innings. MINNEAPOLIS (AP) – Jake Odorizzi pitched six scoreless innings and Mitch Garver, Eduardo Escobar and Brian Dozier homered as Minnesota completed a four-game sweep of Baltimore. Odorizzi (4-6) turned in his third consecutive strong outing, allowing just five hits and a walk while striking out five. In his last three starts, he’s allowed only two earned runs over 17 innings. Baltimore’s Chris Davis homered off reliever Matt Magill with two outs in the ninth to break up the shutout. Orioles starter Alex Cobb (2-11), Odorizzi’s former teammate in Tampa Bay, kept the Twins at bay for the first four innings but still ended up taking the loss. That ties him with Kansas City’s Jason Hammel for the most in the major leagues. KANSAS CITY, Mo. (AP) – Rick Porcello pitched seven effective innings, Andrew Benintendi had four hits and Boston beat Kansas City. The Red Sox hit .385 and had 68 baserunners in sweeping the three-game series. Boston has won six straight and 13 of 16. Porcello (11-3) allowed three runs and nine hits before leaving after 111 pitches. He struck out nine, matching his season high, and walked one. Craig Kimbrel got two outs for his 27th save in 29 chances. Heath Fillmyer (0-1), making his first big league start, allowed four runs, one unearned, on eight hits and three walks. MILWAUKEE (AP) – Jesus Aguilar homered twice, Hernan Perez added a three-run shot and Milwaukee defeated Atlanta. Aguilar hit a solo drive in the seventh and a three-run shot in the eighth. The burly slugger moved into a tie with Colorado’s Nolan Arenado for the NL lead with 22 homers. Milwaukee also got another solid start from Junior Guerra (6-5) during its sixth win in seven games. The right-hander allowed one run and seven hits in six innings, helped by three double plays. Atlanta left-hander Sean Newcomb (8-4) was tagged for five runs and five hits in 3 2/3 innings. CHICAGO (AP) – David Bote drove in the winning run with a bases-loaded walk in the 10th inning, lifting Chicago over Cincinnati. Javier Baez had two hits and two RBIs for the Cubs, who have earned their last nine wins in comeback fashion. Albert Almora Jr. and Ian Happ also had two hits apiece, and Addison Russell drove in three runs. Eugenio Suarez and Adam Duvall homered for the Reds, who had won their previous five series. Luke Farrell (3-3) worked a clean inning for the win. Jackson Stephens (2-2) took the loss. SEATTLE (AP) – Ryon Healy homered and tied a career high with five RBIs, leading Seattle over Colorado. Healy, who had a two-run double in the first inning, put the Mariners ahead for good with a three-run homer – his 18th of the season – in the sixth. He entered the game in an 0-for-13 slump. Wade LeBlanc (5-0) won despite giving up four runs in six innings. The three homers allowed were his most this season. Colorado starter Antonio Senzatela (3-2) allowed six runs and five hits in six innings. SAN FRANCISCO (AP) – Pablo Sandoval homered and had five RBIs to back an uneven start by Madison Bumgarner as San Francisco beat St. Louis. Bumgarner (2-3) earned his second win this season despite an erratic outing. Making his seventh start after missing the first two months with a broken left pinkie, Bumgarner allowed four runs and seven hits in 5 1/3 innings. John Brebbia (1-3) also took the loss against the Giants on Friday.